Dalhousie University spent its early years as a struggling upstart, besieged by sectarian adversaries that kept its doors closed for much of its initial decades. Later, it was dubbed “the small college by the sea,” a brightening beacon of learning and knowledge on Canada’s East Coast. Today, it has grown into the leading university in Atlantic Canada, with global reach and impact like never before. 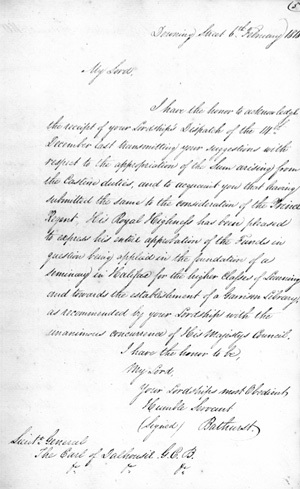 But before all that, Dalhousie University was just an idea on a piece of paper: a letter (left) sent to Lieutenant Governor Lord Dalhousie, bearing the signature of Colonial Secretary Lord Bathurst, authorizing the creation of a new college in Nova Scotia on February 6, 1818. The university that celebrated the launch of its third century on Tuesday, exactly 200 years later, would be mostly unrecognizable to either of those men. (Among other things, the idea of a “live webcast” would have been particularly difficult to explain.) 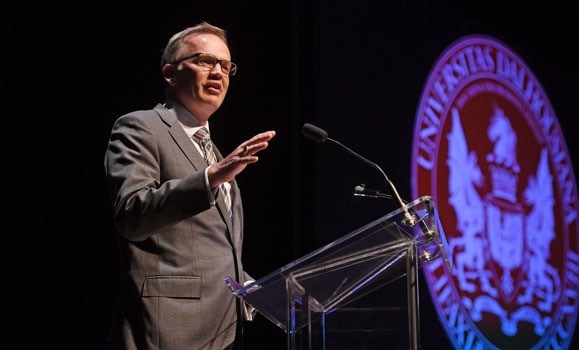 But as Dal’s Bicentennial Launch made clear, there are common threads that weave through the university’s history, all the way back to its very beginnings, binding together its past, present and future. There was the commitment to being a college “open to all,” for one — a concept much more limited in 1818 than it would ever be interpreted today, but which has shaped and challenged the university through years of growth and change. And there was the idea that college would be “of important service to the Province,” as Lord Dalhousie’s letter put it, with its earliest faculties (Arts, Science, Law, Medicine) signaling the need for both a robust liberal education and to train the professionals needed to support the rapidly growing province. 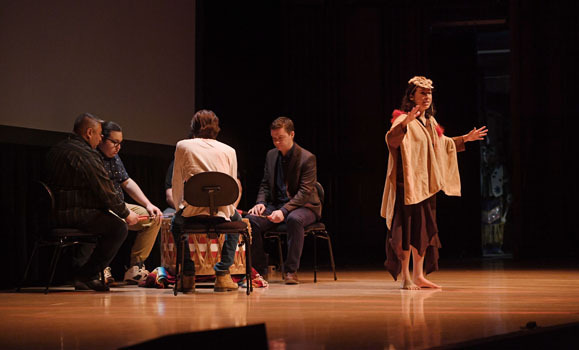 The Bicentennial Launch, Dal 200’s first major signature event, brought together the talents of poets, musicians and many others for a celebration two centuries in the making. Hundreds of students, faculty, staff, alumni and supporters — including His Honour Lieutenant Governor Arthur J. LeBlanc and Her Honour Mrs. Patsy LeBlanc — gathered in the Dalhousie Arts Centre’s Rebecca Cohn Auditorium for the event. Its program included a speech from President Florizone, performances by students from the Fountain School of Performing Arts, and even a video greeting from Prime Minister Justin Trudeau. shalan joundry and Eastern Eagle perform. 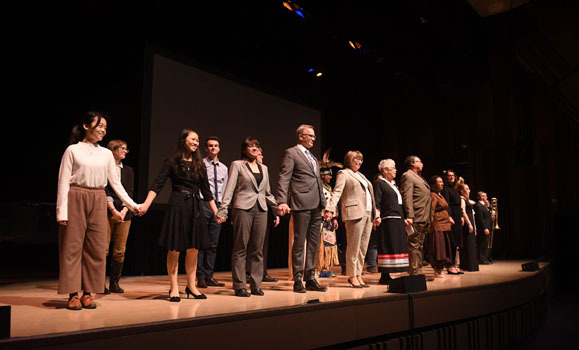 The Bicentennial Launch started with a reflection and celebration of the Mi’kmaq whose presence on Dalhousie’s land pre-dates the university by centuries. Mi’kmaw Elder Jane Abram of the Millbrook First Nation provided an official greeting, followed by a stirring performance from drummer group Eastern Eagle and recent alumnus and poet shalan joudry. Eastern Eagle includes among its members Aaron Prosper, one of several current Dalhousie students who contributed their artistic gifts to the Bicentennial Launch. They included flautist Claire Ahern, cellist Priscilla Lee and vocalist Rachel Monique Taylor, joining alumni like Eastern Eagle member Trevor Gould and guitarist Neven Prostran in helping add beautiful music and song to the occasion. 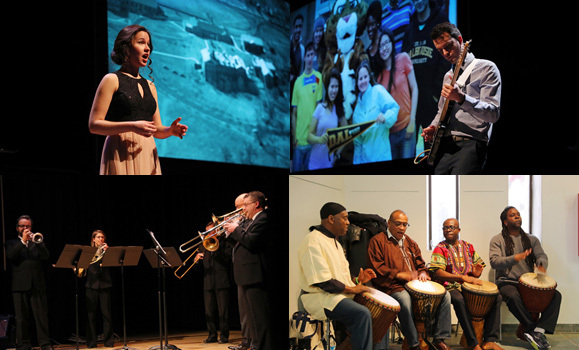 A sampling of Bicentennial Launch performances (clockwise from upper left): Music student Rachel Monique Taylor, Musicology alumnus Neven Prostran, Drummers from Home, and the Maritime Brass Quintet. Fountain School faculty member Margot Dionne lent her voiceover talents to the proceedings, as well, while new Rhodes Scholar Nayani Jensen spoke about how Dal’s learning environment inspired generations of students like her. 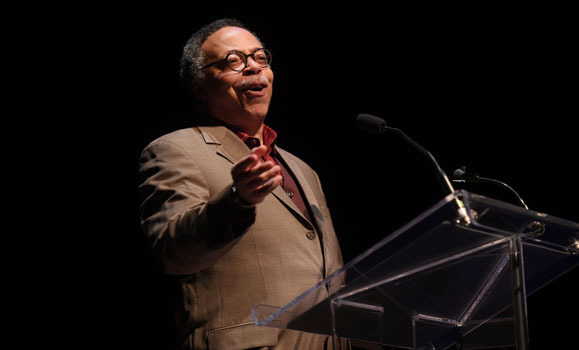 At its heart of the Bicentennial Launch was the poetry of George Elliott Clarke, Canada’s most recent Parliamentary Poet Laureate and an award-winning Dal alumnus (MA’89, LLD’99). Clarke’s epic poem, The Story of Dalhousie — a robust, provocative and powerful interpretation of Dalhousie’s history — was a core inspiration for the event, shaping its themes and presentation. While the poem is too lengthy to have been read in full on Tuesday (as Clarke did Monday afternoon at Halifax City Hall), Clarke appeared on stage multiple times to perform excerpts from it, his energetic, boisterous voice acting as a navigator of sorts through the university’s story. That particular excerpt was shortly followed by a video highlighting one of the forthcoming Dalhousie Originals: Anne of Green Gables author Lucy Maud Montgomery, whose determination to pursue higher education brought her to Dalhousie at a time when few of her female peers in the Maritimes were able to. She was one of several Originals highlighted through the event, joining the likes of Nobel Prize winner Art McDonald, university-saving donor George Munro, Dal’s first African Nova Scotian graduate James R. Johnston, social work professor and senator Wanda Thomas Bernard and Clarke himself. President Florizone's speech offered reflections on the values that have shaped Dalhousie’s 200 years and which point forward into its next century: the transformative power of education; the discovery of new knowledge; a commitment to inclusion; service to society; and the impact of partnership. After the Maritime Brass Quintet presented the first public performance of the rousing “The Eagle and Shield” — a piece commissioned for Dal’s 200th and written by alumnus Paul St-Amand — and just before Drummers from Home’s African drumming sent everyone out into the rest of their day, there was a curtain call featuring all of the morning’s diverse performers. Clarke’s final description of the university — “hauntingly dauntless” — felt like it continued to echo through the Cohn, a challenge to those gathered to continue to push forward as Dalhousie begins its next chapter.